Whether you want to seriously study vocal performing arts or just want to sing with more pizzazz in the shower, you can learn how to use your voice with correct vocal technique. All ages and levels of vocal development are accepted. Students of any age can develop their voices to the quality that puts them vocally in charge of their own voices, allowing them to sing with style and confidence. Singing should be as easy as speaking. Good vocal technique does not require anything that feels or looks unnatural. 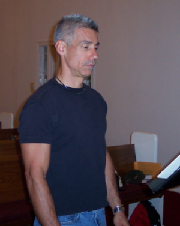 The basis of all good singing is correct breathing, sustained pitch on pure vowels, and ultimately, the expression of emotion and feeling through lyric and melody. 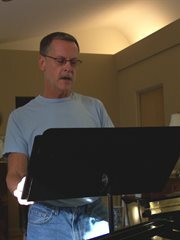 Students will learn correct vocal technique, will improve the tonal quality of their natural voice, and develop interpretive skills using a wide range of repertoire and musical styles. Dan B. preparing for the role of "Linus"